Losing a tooth is no laughing matter, and can be much more serious than you might think. If the gap where the missing tooth was located is left untreated, the teeth around the area may shift, eventually even coming out of socket. This can be incredibly painful, as well as affect your ability to speak and chew properly. A dental bridge can help. Dental bridges can also be used as a more comfortable replacement for partial dentures. There are several types of dental bridges available. Your Stonebridge Dental professional will perform a thorough examination and discuss which option is best for you when you come in. The most commonly used type of bridge is known as a fixed bridge. This type of bridge consists of artificial teeth fused to a piece of metal that are held in place by porcelain dental crowns placed over anchoring teeth on either side of the bridge. This bridge will need to be made in a laboratory in order to ensure proper fit, and you will most likely be given a temporary bridge to wear in the meantime. 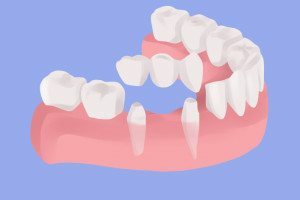 Once the permanent bridge arrives, your dentist will fit it carefully, and verify that it feels comfortable and natural before it is cemented into place. If you have lost a tooth or multiple teeth for any reason, call Stonebridge Dental today at 972-547-0554 for a consultation. Leaving these gaps for two long can cause painful changes in the position of your remaining teeth, as well as changes in your overall facial appearance. Our professional staff will be able to advise you on which dental bridge will be right for you, as well as get your bridge made as quickly as possible. Let us help you fill the gap left by those missing teeth so that you can have a smile you are proud of and confident with as soon as possible.